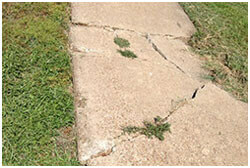 Need Cracked Concrete Repair In Plano? Concrete Contractors Can Help. Get Cost Estimates On Problems. Want concrete repair in Plano, TX? We’re helpful contractors that stop concrete cracks and other common issues. At HD, we’re known for our affordable costs and offer free damage appraisals. So if you are seeking excellent Plano service and want to enlist established concrete contractors, contact us. When it comes to cracks and concrete surfaces, there’s a lot to learn. For one thing, concrete is the most widely used man-made material in the entire world. That’s why contractors use it to create so many surfaces. And though it’s very durable, it often requires repair. Concrete gains its strength when it cures, which takes approximately 28 days. Due to summer temperatures in the DFW area and large volumes of rain in Plano, contractors are often contacted about concrete cracks and repairs. That’s because fractures are a common problem. Of course, property owners are frequently concerned with costs, too. You’ll find that fees for fixing concrete are generally calculated by the square foot, although the cost of making repairs on surfaces made out of concrete can be figured differently. With almost 271,000 residents in Plano, questions about what concrete repair costs come up a lot. Small resurfacing projects can be as low as $1,500, while large jobs on vast properties can cost upwards of $10,000. Its all depends on how large the area is and how damaged it has become. It’s important to note that the majority of structural concrete ranges from 3,000 to 5,000 psi (pressure per square inch), while psi of 6,000 is generally considered to be “high strength” concrete. At HD, we use the psi that is best suited to your needs. We also pave surfaces. If you live have a sidewalk, walkway, retaining wall, deck, porch or other surface that needs service or paving in Plano, just schedule a concrete repair estimate free online today. Our evaluations are thorough. Contractors offer assistance by improving your surfaces and fractured surfaces in the following ways: (1) Contractors make effective repairs on your concrete that will help you maintain your property value. This may involve cutting and replacing broken portions of your surface. (2) By lifting your concrete in order to fix it, contractors are able to prevent future concrete damage and resolve common issues affecting your property. To learn more, call concrete contractors for help. As any professionals in Plano will tell you, it’s always wise to resolve common concrete repair problems. You’ll discover that cracks start off small and then become larger over time. When they become bigger than 1/8″, moisture develops inside the gaps and weakens your concrete. 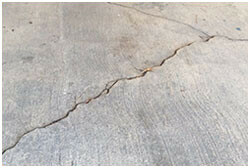 You’ll want to discover what is causing any concrete cracks and have them repaired. If they’re big, contact us. We’re Plano concrete contractors that service residential and commercial properties including apartments, and are a Better Business Bureau-affiliated company. 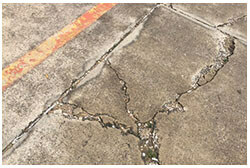 As experienced contractors, we can help by solving ordinary problems such as cracked concrete surfaces. (3) We also resolve a variety of dilemmas by pouring brand new concrete areas or paving them. Oftentimes, that’s the best solution to troublesome issues. Breaks are a hazard so it’s important to fix your concrete as soon as you detect problems. Contractors like us can help. Weather and soil are two things that ordinarily cause gaps that must be repaired. That’s because concrete expands and contracts with temperature changes. When soil moves, that affects your surfaces, too. There are lots of things that commonly cause problems. As expert concrete contractors, HD offers Plano service and repairs concrete areas correctly. We also pour and pave new surfaces. It’s important to have your property evaluated for signs of damage and obtain appraisals for fixing it. Until HD actually sees your broken concrete, we won’t know for sure how damaged it is and how much work is required. If you see cracking and think you may need contractors that can provide expert concrete repair service in Plano, contact us online today to schedule a free estimate and inspection. Or, just phone us.